There are many banks in Canada well placed and accessible. ATM machines are always located outside of the bank, as well as in independent kiosks through the cities and malls. When taking money out of an American account, the exchange will automatically be made from American to Canadian currency, using the rate of the day. A service fee will also automatically be added. 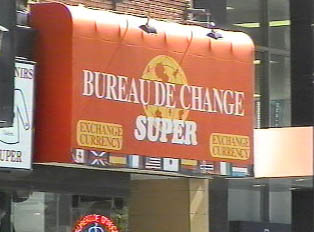 When changing money at an exchange bureau, there will be a higher rate of exchange, but the fee for service will be more. When changing money at any kind of convenience store, the exchange rate will be lower and there will be no fee for the service. It is also possible, in many Canadian stores, to simply use American dollars. The cashier will compute the rate of exchange, and the customer will avoid the fee charged by a bank or a bureau. It is good to inquire first, however, whether any particular store accepts American dollars. Canada has a $1.00 coin commonly referred to as a "loonie" and a $2.00 coin commonly referred to as a "toonie".